In Zen Buddhism, the concept of freedom is of profound importance. And yet, until now there has been no in-depth study of the manifestation of this liberated attitude in the lives and artwork of Edo period Zen monk-painters. 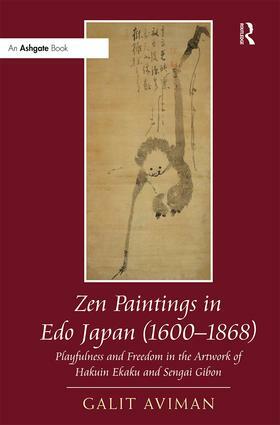 This book explores the playfulness and free-spirited attitude reflected in the artwork of two prominent Japanese Zen monk-painters: Hakuin Ekaku (1685-1768) and Sengai Gibon (1750-1837). The free attitude emanating from their paintings is one of the qualities which distinguish Edo period Zen paintings from those of earlier periods. These paintings are part of a Zen ink painting tradition that began following the importation of Zen Buddhism from China at the beginning of the Kamakura period (1185-1333). In this study, Aviman elaborates on the nature of this particular artistic expression and identifies its sources, focusing on the lives of the monk-painters and their artwork. The author applies a multifaceted approach, combining a holistic analysis of the paintings, i.e. as interrelated combination of text and image, with a contextualization of the works within the specific historical, art historical, cultural, social and political environments in which they were created. Galit Aviman received her PhD at Ben-Gurion University of the Negev, Israel in cooperation with Kyoto University, Japan. She conducted her post-doctoral studies at the Edwin O. Reischauer Institute of Japanese Studies, Harvard University, USA. She lived in Japan for ten years in total. Currently she is a lecturer at Ben-Gurion University of the Negev, The Hebrew University and Tel-Aviv University.